Meghan has done it again!! I love the exhilarating and fast pace of these stories, Meghan doesn’t beat around the bush, she goes straight to the point and she enwraps her readers attention from the very first page. When her life seems to be crumbling around her, as the daughter of a notorious mob lords in America, Eden has to flee and leave it all behind to embrace a new identity in a new location, her new home away from home, New Orleans. Arriving in the middle of Mardi Gras, Eden soon realises she might have bitten more than what she can chew and danger is closer than what she thought, but a hunk of a tattoo artist rescues her when she is at her lowest and destiny keeps putting them in each others paths. Bishop has lost everyone that ever matters to him, having run to start afresh in a new place the last thing he was expecting was to find his past colliding with his present, literally. 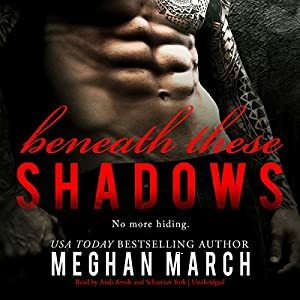 This was by far my favourite in the Beneath series, I completely fell for Bishop and the interaction between him and Eden is explosive from the get go, the perfect Alpha BBF and a story with plenty of angst and steamy moments make this a perfect audio book. Goes without saying that Sebastian and Andi did an INCREDIBLE job as usual, another book and another flawless performance!